The MBNA World Elite card is one of a few cards you want to keep in your wallet for non-category spend. 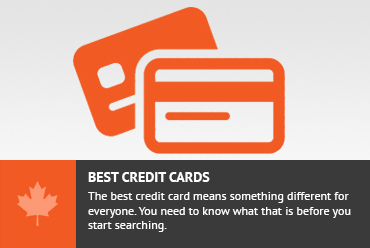 I recommend it strongly, and I personally use it as my go to card. It is a MasterCard so there acceptance is not an issue. This card gives a full 2% return, in restriction free, cold, hard cash. I personally think this is the best of the lot of World Elite cards and stacks up nicely against pretty much any card it should naturally be compared against. The MBNA World Elite card earns 2 MBNA Rewards for every dollar spent on all purchases. There are no category bonuses and every dollar earns a healthy 2 pts. 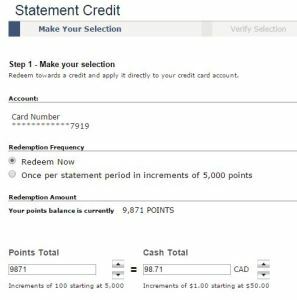 Points are redeemed at a rate of 1 pt = $0.01 with a minimum redemption of $50. Points can be redeemed for a few things, but the best value comes in the form of a cheque or statement credit or direct deposit. Points are redeemed at a rate of 1 pt = $0.01 with a minimum redemption of $50. This makes this as close to a true 2% cash back card as you can get. Even when you are looking to close the account, you can extract every single cent of your rewards leaving no orphaned points. Fortunately (or unfortunately), the best value comes from the cash options (statement credit, cheque or direct deposit). In fact the gift card options cost more than cash (a $200 gift cert to The Keg costs 21700 pts). If you really are interested in the gift cards, then just get the cash or statement credit and buy your gift card directly from the merchant. Same goes for travel. This makes it very easy to decide what to use your points for as the most valuable option (cheque or statement credit) is also the best priced. Nobody should ever be redeeming MBNA Rewards from this card for anything other than a cash option. 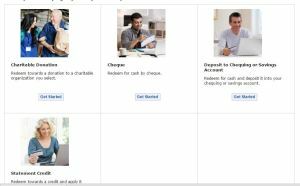 Click on the Cashback and Charitable Donations and you will be presented with the 4 different cash options. I chose statement credit. Select the amount you want to redeem and you are on your way. You can redeem in increments of $0.01 with a minimum of $50 redemption. Each of these cards earns very close to 2% return on all spending. The Capital One Aspire card has a $120 annual fee and gives 10000 points each year as an annual benefit, which essentially reduces the annual fee. The redemptions also are a little trickier than just straight cash as you need the right amount of travel charge to get a statement credit. Many people will get slightly below 2% return as a result of the structure. I would say that for this reason, the MBNA card comes out slightly ahead. Basically it works out to the MBNA card giving full 2% return for a slightly higher net annual fee. The BMO World Elite card gives 2 points / dollar spent and each point is worth $0.01 towards a travel booking made through the BMO travel site. While I have found that the BMO travel site generally has the same prices as Expedia and the like, people who have commented on this site have mentioned that the prices there are higher. This restriction does make the MBNA card a more favourable card. The BMO World Elite card also has a $150 annual fee, but often has a 30,000 point ($300) sign up bonus so you can make out there. If you bank with BMO then you can get this annual fee waived. The BMO World Elite also prides itself on having very good insurance benefits, though my experience with them had them not paying out on a $20 charge that I had phone approval for. My experience has been that the MBNA World Elite card is a slightly better user experience, though I do not bank with BMO and that may make a difference. The MBNA card comes with a $89 annual fee, that is waived in the first year. Through forums and my own personal experience, up until about 2013, it was possible to apply for a MBNA Platinum Plus card and then get asked to change over to the MBNA World Elite card with no annual fee. I am personally grandfathered into this. Reading the forums now, it appears that this trick is dead. I wouldn’t expect this route to work anymore but if you are interested, then apply for the Platinum Plus card here and hope they product change you. The signup bonus for this card is 10,000 points after your first purchase, which can immediately be redeemed for a $100 statement credit. The bonus is great as it gets you over the minimum redemption threshold. If you are interested in trying this card out, then you can apply and then you can cash out all points earned thanks to this sign up bonus. Thanks for this very helpful review. I just applied for the MBNA World Elite card. On the phone today, they told me that additional cards on the same account are free. If this is true, it is another plus for this card. Love the info you have here. This is fantastic. It is currently December 2016… and just to note, they are NOT waiving the first year fee, currently. Do you have any insight into whether there are special times during the year when they do offer the first year waived… as an incentive? Interested in trying it… but NOT interested in paying a fee to try it. I have never seen this card wtih an annual fee waiver. They treat the bonus $100 of points as a annual fee waiver and never give more than that in my experience over the past several years. AND they are reducing the benefits. Instead of 100 points giving $1.00 cash reward, it will be 120 points for $1 cash reward. Don't subscribe All Replies to my comments Notify me of followup comments via e-mail. You can also <a href='https://www.creditwalk.ca/comment-subscriptions/?srp=4487&srk=2648578ecea05c83754707575dc5a494&sra=s&srsrc=f'>subscribe</a> without commenting.